Chances are you’ve already caught wind of the firestorm that is brewing around the annual Al Smith Dinner. For those unfamiliar, the entire controversy is based largely on unverified, secondhand, claims that Cardinal Timothy Dolan has extended an invitation to attend the prestigious event as a co-keynote speaker to President Barack Obama – the most aggressive proponent of abortion-on-demand the Oval Office has ever seen. Well don’t you believe a word of it. The Alfred E. Smith Memorial Foundation Dinner is a more than half-a-century old tradition; a white tie affair named in honor of former New York Governor, Al Smith, who was the first Roman Catholic presidential candidate in U.S. history. In election years, the presidential candidates from both major parties are typically (not always, but typically) invited to speak, not to rehash well-known policy positions; but rather to address those in attendance in more jovial tones while “roasting” their political adversary with good-natured humor. 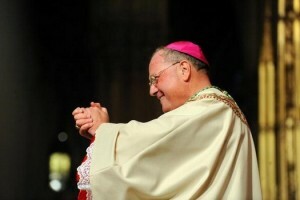 The annual event, held each October, is hosted by the Archbishop of New York. It represents a great opportunity for the candidates to show their more “human” side to prospective voters, but even more importantly, it also makes for a rather powerful “photo-op” wherein the presidential contenders share light-hearted moments of fellowship and laughter with some of the most influential members of the American hierarchy; images that undoubtedly signal (whether intentionally or not on the part of the host-prelate) the stamp of Catholic acceptability that every candidate covets. It is in light of the quasi-official imprimatur that is naturally imputed by such an appearance that I refuse to believe that there is any way on God’s green earth that Cardinal Timothy Dolan is going to allow Barack Obama to bask by his side in such an honorable light as this. The spokesperson for the Archdiocese of New York has been asked numerous times to confirm the vicious rumors that Obama has already received Cardinal Dolan’s invitation; so too has White House Press Secretary Jay Carney and each has steadfastly refused to do so. Even so, some in the media, Catholic and otherwise, still feel justified in risking calumny by calling into question the integrity of the Cardinal Archbishop. The invitation is far from a given based on recent history alone as both Bill Clinton and John Kerry were denied the honor of attending the Al Smith Dinner based on their own anti-life positions. How dare anyone imply that Cardinal Dolan, who said that Notre Dame made a “big mistake” by inviting President Obama to deliver their 2009 commencement address, is going to fail to do otherwise? “There’s a lot of things that President Obama does that we can find ourselves allied with… but in an issue that is very close to the heart of the Catholic world view, namely, the protection of innocent life in the womb, he has unfortunately taken a position very much at odds with the Church,” Dolan said in his public condemnation of the Notre Dame affair. And now we’re supposed to believe that the Cardinal has since softened his position, as though he and Obama have found common ground with regard to the dignity of human life – the most fundamental principle of Catholic social doctrine? This after the president betrayed Cardinal Dolan’s trust by reneging on his personal assurances that the Administration would not impede the good work of the Church via mandate? Certainly not! Look, Cardinal Dolan is no fool; he’s well aware of who and what he’s dealing with. He knows that 54% of self-identified “Catholics” cast a ballot in favor of Barack Obama back in 2008; a man who has since removed all doubt as to his anti-Christian agenda and bald-faced duplicitousness. With the Al Smith Dinner taking place mere weeks before the election, everyone with an ounce of common sense and a mustard seed’s worth of faith, not the least of whom is Cardinal Dolan, understands what’s at stake. He knows how critically important it is for the American episcopate, beginning with the President of the United States Conference of Catholic Bishops, to avoid giving any appearance that a Catholic may in good conscience cast a vote for such a recalcitrant enemy of Holy Mother Church as Barack Hussein Obama. Perhaps those who are suggesting otherwise don’t realize just how grave their allegations truly are. Maybe they don’t know that they are essentially saying that Cardinal Dolan is about to unleash a scandal of epic proportions by abandoning his duties as shepherd; sowing the seeds of confusion and death among the flock he has pledged to protect unto martyrdom. And for what? So he might be applauded for his “open-mindedness” by the enemies of Christ the King? Let us put the rumors aside and resolve to pray for Cardinal Dolan, that this Prince of Holy Church may remain steadfast and true in defending the integrity of his exalted office and the good of the souls entrusted to his care.